WHMIS has been with us since its introduction in 1988 and since then has gone through two revisions. The latest being the update that brings WHMIS into the 21st century. WHMIS came into effect on October 1, 1988. The formation of WHMIS came out of the discussion regarding the Dangerous Goods Act in 1985 after the federal and provincial governments recognized the need for a national workplace hazard communication standard. The Mississauga train accident in 1979 in part prompted this. The City of Mississauga was evacuated due to a train crash and led to the evacuation of all 225,000 residents. Luckily, there were no fatalities. The evacuation of the city was ordered as the train was carrying toxic gas, flammable gas, and liquid flammable materials. The ensuing explosion dispersed the toxic gas into the atmosphere before firefighters were able to contain the scene. 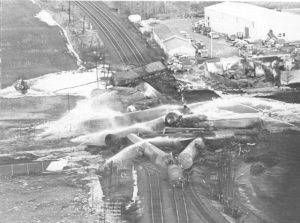 The aftermath of the 1979 Mississauga derailment. WHMIS training is now mandatory in workplaces and required by law to be taken. If you work with hazardous materials of any kind, then you’ve likely taken WHMIS at some point. If you haven’t taken it in a long time and require a refresher or this is new to you, it’s a great idea to take the award-winning WHMIS online or self-teach with Danatec. Danatec has been training learners on WHMIS for over 33 years. Every update or regulatory change is kept up-to-date with Danatec’s WHMIS training. The first revision to WHMIS was to incorporate the Globally Harmonized System of Classification and Labelling of Chemicals, the internationally agreed-upon standard managed by the United Nations. This latest revision is to bring WHMIS training up to 2015 regulations and standards. Learners and instructors will no longer be required to teach or learn WHMIS 1988 materials. The latest edition also includes two brand new scenarios, which are both compelling and engaging. 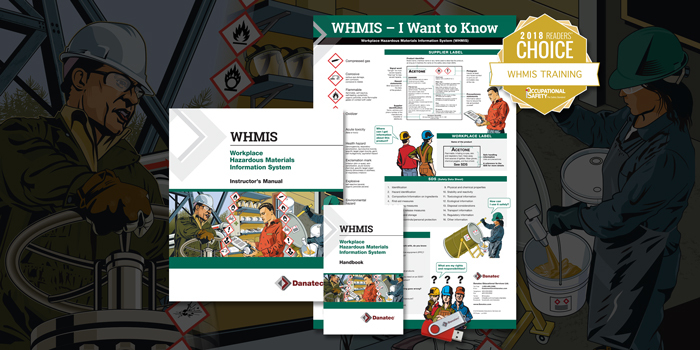 Loaded with improved and updated illustrations, graphics and content the new WHMIS course is sure to please even the most stubborn of learners. An updated exam is included as well. As the deadline for compliance approaches, Health Canada has the agreement of federal, provincial and territorial jurisdictions that workplaces will be compliant by December 1, 2018. Specific dates may vary, check http://whmis.org/ for additional information. The last date that Material Safety Data Sheets (MSDS) with WHMIS 1988 labels can be sold to a workplace will be August 31, 2018. Hazardous products sold or imported for use in the workplace in Canada must be compliant with the latest WHMIS by September 1, 2018. Ensure that your complaint and transition is smooth. Learn and train with the best. WHMIS Online Training – The most recognized WHMIS course in Canada that meets all of Health Canada’s training requirements. WHMIS Self Teach – The most recognized Self-Teach WHMIS course book in Canada. Safety training built by safety experts. WHMIS Instructor’s Package – Danatec’s award-winning WHMIS Instructor’s Package has everything you need to teach a compelling and comprehensive WHMIS course. WHMIS Poster – The new WHMIS poster grabs your attention with bold images and is now dry-erase compatible. WHMIS Handbook – The new 60-page WHMIS Handbook is an excellent tool for every employee who works around hazardous materials.